There are two kinds of people in the world. Those who love wearing bows, and those who prefer to do without. I fall into the former category, but if you do not, perhaps I can sway you. You see, bows are inherently girlish and sweet and, when worn well, give off a young, fresh and even flirty vibe. And despite what many think, bows are appropriate for all ages and aesthetics, so don’t restrict them to use by schoolgirls and Lady Gaga. Last week I raved about hair serving as its own accessory and this week I’m doing the same. Only instead of sharing braided headband tutorials, I’m talking about — you guessed it — bows. Specifically, bows made out of hair. Before you quietly back away out of fear that this style’s too tricky to master, I urge you to stop right there. Because you know what? 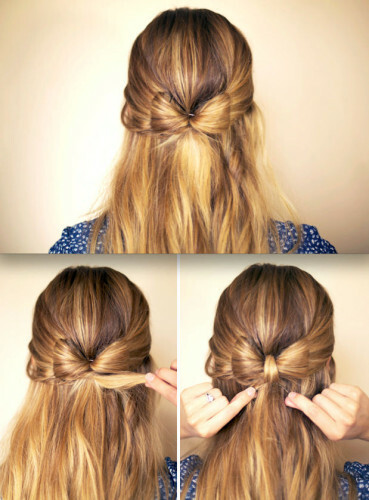 Anyone can master bow hairstyles. Katie from RunningOnHappiness breaks her bow bun down into five simple steps. 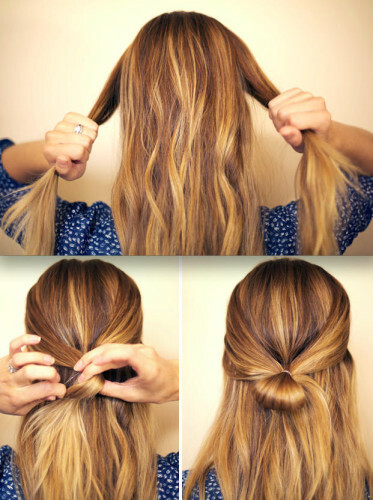 She says to begin by gathering your hair into a high ponytail and looping hair through an elastic band with the ends sticking out. Next, pull apart the bun to create two loops (makes each side of the bow) and use the ends to wrap between (creates illusion of a bow knot). 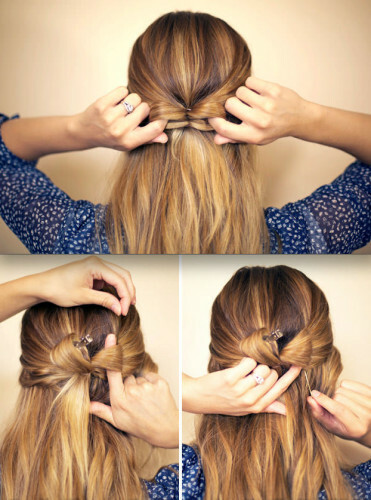 Secure with bobby pins and you’re ready to go. Dealing with an unruly mane of curls? As Mr. Kate demonstrates, you don’t have to have stick straight hair to wear this style. She creates a near identical bun to Katie’s, but instead embraces her curly texture (and unwashed coiffure). Bonus: Kate styles several outfits around her bow bun hair to help inspire your own ensembles. While Kate and Katie’s bow buns are quite lovely, I have to admit that I’m more partial to the bow hairstyle that Steph from HairAndMakeupBySteph conjured up. She actually created this look for a bride and, after blog readers gushed and pleaded for her to share a tutorial, she obliged. If you’re looking for something slightly more subtle, let me introduce you to YouTube user Rosebud43. 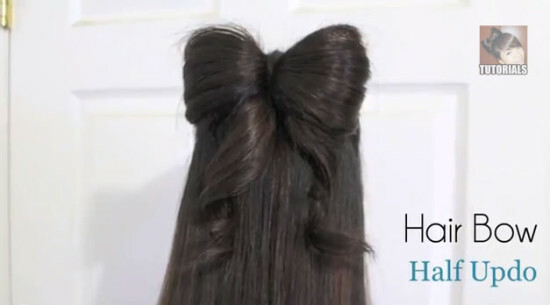 With much detail, she teaches viewers how to create wee little bows that look great on either pig tails or a low pony. Lastly, I have to show you Youtube user Bebexo’s take on the bow hair trend. Her bow is similar to Steph’s half up hairdo, but her style includes “ribbons” that are also made from hair.